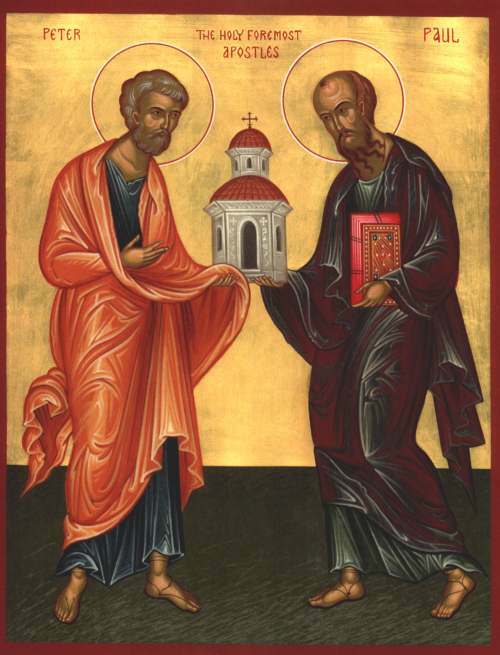 The two icons represent important truths, not only about Peter and Paul, but about the church. Paul tells us in his letter to the Galatians that he confronted Peter over matters of the Jewish law and accused Peter of cowardice and hypocrisy (Galatians 2:11-14). Peter had already been instructed by a vision from heaven (Acts 10:9-16) that in God’s eyes all are clean, nothing is unclean. It was a clear command that the Law of Moses would no longer be an obstacle to the mission of the church. But it seems that on occasion Peter forgot the vision or gave in to the pressure of other visions, and hence the confrontation with Paul at Antioch. The icon of embrace shows the reconciliation of the two apostles. The two icons go together. They remind us that in the church competing opinions and visions are always present and sometimes come into conflict. But the Church is built on forgiveness and reconciliation. And that brings us to the first icon above. 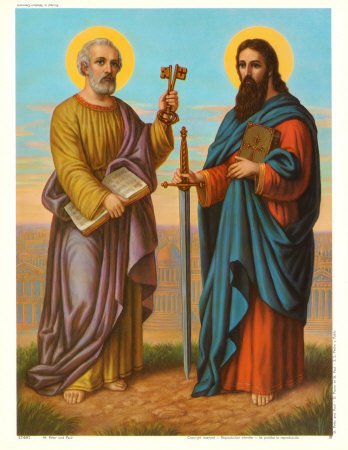 Peter and Paul are shown supporting the church jointly. Their reconciliation makes it possible to draw this icon. In the Gospel reading for June 29th (Matthew 16:13-19) Jesus gives Peter “the keys of the kingdom of heaven.” In Ephesians 6:10-17, Paul encourages his readers to put on the “whole armor of God.” The final piece in the armor is “the sword of the Spirit, which is the word of God.” Peter is given the keys, while Paul wields the sword of the Spirit. The keys and the sword go together, they complement each other. And they too, need reconciliation, just like the apostles themselves. Keys unlock something that is closed. The apostles were commanded to unlock the kingdom of God. But how is the kingdom unlocked? By preaching the word of God – but not just words; rather words that cut like a sword with the power of the Holy Spirit. The power of the Holy Spirit is in that question, “Brothers, what shall we do?” The word of God, when it is preached with the power the Spirit, requires a response. If there is no response, then it’s just words, preached without power, without the sword of the Spirit. The word of God cuts through our defenses like a sword and opens our hearts and minds to the riches of the kingdom. The keys and the sword go together. Peter and Paul are honored together. They need each other. The church continues to have the keys to the kingdom, but only through the sword of the Spirit, which is the word of God. Categories: Biblical Explorations | Tags: keys of the kingdom, reconciliation, Saints Peter and Paul, sword of the Spirit | Permalink. I like the keys and the sword together. When you quote from Ephesians doubtless you want us to remember that we are not fighting against flesh and blood but against the powers of spiritual evil in high places, which are only too evident in our world.